PLACE:Queen Margaret Union, 22 University Gardens, Glasgow, G12 8QQ. How to get there: University Gardens is four minutes walk from Hillhead Underground station. The underground links with Queen St and Partick main line stations. There is car parking in Lilybank Gardens and a few spaces on University Gardens, but allow time to find a space and adhere to local meter restrictions. Of course, if you can't make the launch, you can buy the book already on Amazon - it should be in the shops on the 1st of September - but the book launch will be a lot more fun! Billy and Dave were in the Kingshouse, waiting, as we were to rendezvous there. By the time I arrived they were a few pints happier, and we camped by the infant Etive, waking to a gorgeous, winter day. It was good to see Dave again. He was nearing the end of the Munros, but had never visited Ardgour or Moidart before, so we crossed the Corran narrows and headed for Sgurr Dhomhnuill. Garbh Bheinn was pencilled in for Sunday as the others hadn’t been there yet. I didn’t mind visiting it again so long as I got Sgurr Dhomhnuill. This is the highest hill in the whole island-like area south of the A830 Fort William to Mallaig road. 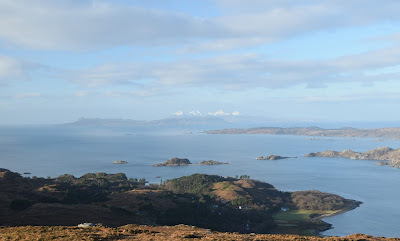 Several times near the start of my hillwalking career, I’d looked across the West Highlands from some Munro or other and wondered what that prominent peak was in the distance. It took me a while before I twigged that the reason I couldn’t place it was because it wasn’t another Munro, but a Corbett: though at 888m, it is not far off Munro height, and it has to be approached virtually from sealevel. Full of high spirits, we continued onwards for the final pull to the summit, taking photos of the fine scenery, our heads down against the occasional band of stinging hail. We took a southerly line to avoid the buffeting wind, and there was a bit of mixed snow/rock scrambling. All good healthy fun, but we decided it was best not to descend this way. The summit was uncomfortably windy. The wind made it hard to stand, and it cut through our clothes like a stiletto shower. Only a Corbett! But we were glad not to be higher with this wind. “Let’s go down the other way,” I shouted, “then head down the glen.” “That’s what I was thinking,” said Dave, and so we headed northwest from the summit. Dave was leading. The way seemed to end at a cliff face. “No way down this side,” he indicated, and I tried the other side. It looked steep, a snow slope leading who knows where? I hesitated, suddenly nervous, and Dave took the lead again. The snow was disturbed, so presumably someone had already come down this way. This was of some comfort. Dave descended, then the wind caught us again. I crouched and grasped my hired axe as tightly as possible. The slope we were on ended in nothing. I really didn’t want to be blown over it or slip. Dave took a side way down, sending up clouds of stinging spindrift. Crouching, head turned, I waited it out until the spindrift passed, then followed him over the lip of the snow bank. Below was nothing but a further snow slope, even steeper now, ending in nothing. I wasn’t happy. Descent seemed slippy. It was hard to tell with a face full of spindrift where I was putting my feet in all this sugary snow, so I turned again until it cleared a bit. Billy was above, having had to wait for me to finish moving before being able to continue. When I turned back, Dave had disappeared. I dropped a little further, getting closer to the edge. There didn’t seem to be any safe way. Surely he hadn’t... my heart hammered hard and senses became super-alert as I considered the serious risk I might be taking if I went on. I looked across, and realised a large block of snow had carved a path of sorts away to our right before disappearing over the precipice. Suddenly it hit me. The disturbed snow we were following was not old footprints – it was avalanche debris! I stopped, and waited until Billy reached me. “Dave!” shouted Billy. He had spotted him. A second later I saw his axe battering at the edge of the precipice, and he hove slowly into view. ‘Back up?’ I pointed. ‘Back to the top,’ Dave signed. Billy led the way, slowly making sure of each step, slipping occasionally. I tried cutting steps with the ice hammer. Some of the snow was hard, but much of it was sugary, and would provide no purchase for arrest in the event of a fall. Back into the screaming wind, legs tensed for all they were worth, we made a slow ascent. Billy waited for us on higher, safer ground, lying down holding his axe. We laughed in relief. Dave appeared. He had cramp, and didn’t feel like laughing. There was only one thing for it: descend the way we had come up. Dave hurried us along despite the gorgeous sunset over Beinn Resipol, despite Garbh Bheinn turning a deep blue. We reached the ‘ascent’s steep bit’ and laughed. We could descend this facing forward! It was nothing compared to what we had just foolishly attempted. “I forgot the rule,” said Billy; “NEVER follow old footprints.” Especially when they aren’t footprints at all. As darkness gathered, the constant wind started to get to us. But once back on the mine track our spirits were restored, though we were humbled by the lesson a mere Corbett had taught us, amazed that despite our experience, we could still have such a close scrape. “Three pounds fifty!” he said, remembering my hired ice axe. Dark shapes of deer flitted silently through the trees.